oh sweet little bird up high, you are such a delight.....! I did a quick search for Charles Joseph Grips and saw more than one painting of his that was so very similar to this, yet different. 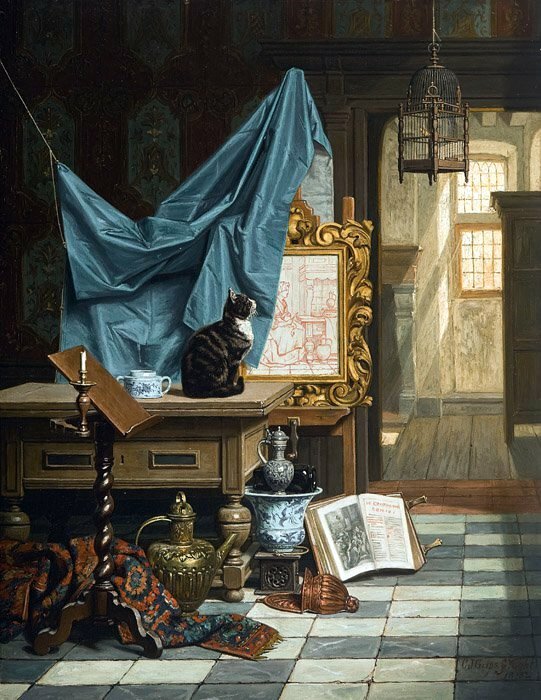 They each have the cat, the book, the cloth drapery, the framed painting, etc. Does he have other common themes as well? I like his work. I didn't know the painter before, I choose this painting because of the depiction of a 17th century interior, it reminded me of Vermeer. I like his work too; the demeanor of the cat is very lifelike indeed!